I have an extensive collection of vintage Nancy Drew mysteries. My guidelines for collecting them are as follows: no buying complete sets (too easy) and nothing over three dollars. I’m not sure how many I own and I have no idea whether I’m getting near a complete set or whether I’m just slowly amassing twenty copies each of the first three volumes (the easiest to find, by far). I thought once about making a list of the ones I have and the ones I’ve yet to find, but where’s the fun in that? I buy blue ones as well as yellow; the only ones I won’t buy are the glossy yellow editions that I owned as a child. This story sounds insane no matter how it’s told, but when we went to live on Ambergris Caye for a summer—a summer that must now be twenty years in the past—we packed suitcases full of portable food (Kraft Macaroni & Cheese) and books. We also packed one of our cats, Zora. My suitcases were filled with a complete set of those schoolbus-vivid Nancy Drews. I know that I read them all—if I reach back far enough, I have strange shadowy recollections of a jewel thief and strawberry blond hair—but I can’t remember ever sitting down to read at all that summer. I must have; my brother and I could not have spent four months watching eels twist among the pylons of the docks and eating sweet corn ice cream delivered on the back of a bicycle. I remember an eclipse that peeled back the ocean and left miles of clams slurping the last drops of saltwater in shallow hollows; I remember stray cats, cockroaches, and the calluses on my feet from months without shoes. I can’t remember much about Ned, Nancy, or Bess. I think there was a convertible. 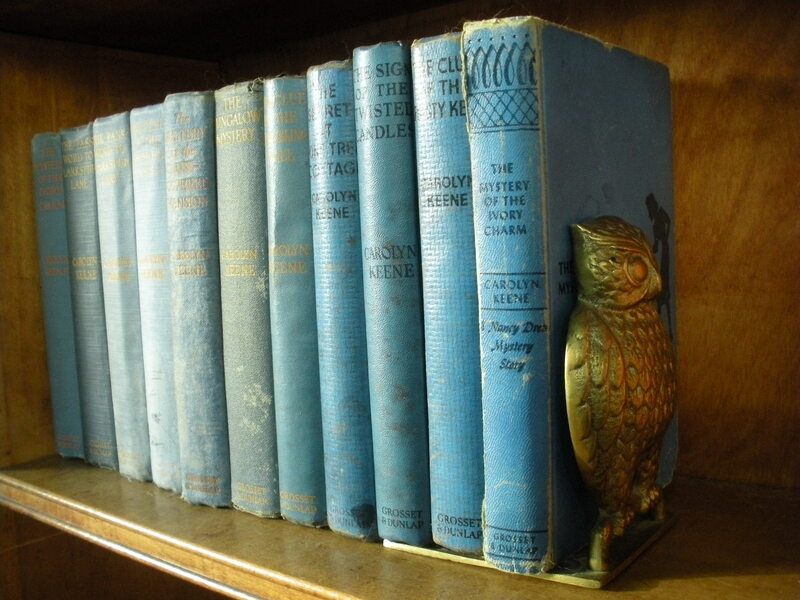 Later, we gave my Nancy Drews to the library of my elementary school; I remember returning to the shelf that housed my collection and opening each one to see the book-plate that acknowledged our gift. I never felt a very profound connection to that set of books. I can’t explain why, fifteen years later, I started collecting them again. Perhaps, through the unexpected lens of “The Password to Larkspur Lane,” I want to revisit sea urchins and scorching equatorial sun—but these mildewed and moth-eaten copies seem an odd way of returning to my youth. The pathways at Wellesley were lined with a series of banners bearing the names of famous alumna and the slogan “Women Who Will Make a Difference in the World.” On my way to the library, I used to walk beneath one celebrating Harriet Stratemeyer Adams, class of 1914: aka Carolyn Keene. aw, yeah. it was a roadster! beautiful! tell me again, why don’t you write poetry anymore? volumes I owned as a child.